Whatever I Think Of! 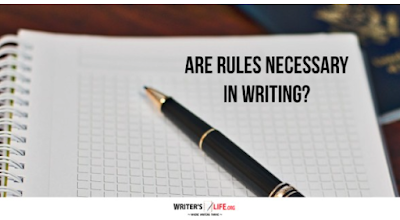 : Are Rules Necessary in Writing? It seems weird to see this article after writing several posts in which the idea of breaking rules when writing has come up. In life in general, rules were meant to be broken. This is also true in writing, as this article says. Since resurrecting my creative writing group at work and joining the I have been trying to write more since I have been slow at doing so. I invited the former owner of the local bar who self-published her memoir to join the group and she said this is the kick she needed to get writing again. I've bene trying to write more, but as the article says, it isn't possible for some to do and they shouldn't feel like less of a writer for not doing so. Whenever someone at work said they have been working on their writing, I would sometimes feel guilty about not doing as much on mine. But now I don't feel as guilty, because I have to do what I can when I can. It's all bout how each person does it for themselves. Though when others say how much and how often they have been working on their writing, it can give me the kick I need to get working on mine even more. This is a way to encourage one another to write more, but still do as much as each person can each time. Writing about what you know--I have heard that one many times and have at times imagined the scenario of others reading what I write and saying, "This is about me!" This has been used as a gag on TV shows and I have wondered how often it happens in real-life, and how angry a real person gets when seeing such a thing. When I worked on my memoir, I chose not to use real names of others involved, including my own family, out of fear of lawsuits or even just general anger, should the book ever see the light of day in print. When writing my diary novel, I mostly drew from what I remembered of having braces in the 1980s, but added some things that didn't happen to me, like getting sick on Thanksgiving or playing the main characters in a school play. The first one just dawned onto me. The second idea seemed typical of books and movies in which the popular kids try to get everything and are angered when the nerds get it instead. The nerdy kids in my books get the leads in the play, something the head mean girl had hoped she'd get. She then gets angry over being cast as a servant. This sort of scenario my not have happened to me personally, but it seemed typical of the time period in which the story is being set. What rules have you followed and broken? We have a friend (who sees himself as a writer) who doesn't read. I would dispute his self assessment. It doesn't make sense to me either, EC. I was really hung up on the show don't tell for most of my writing career. I'm finally relaxing that. There are spots it adds a layer to writing as long as its not overdone.